No strange dreams last night - and do you know what? I forgot to drink a lot of water before bed. This is further confirmation of my hypothesis: a hydrated brain fuels a healthy subconscious. Woke up this morning feeling average. Limited activity to be seen in the tray of peas, to which I also gave a quick spray of water for good measure. A commenter on Facebook suggested that black bin bags are sometimes treated with chemicals to prevent molds and smells, which seems like the sort of thing that is probably true. 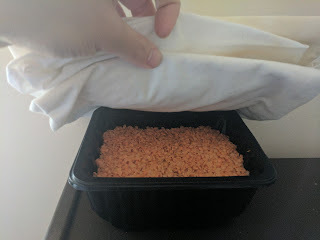 This is my very first microgreens experiment, and there are a lot of helpful and friendly experts out there, from whom I have much to learn. 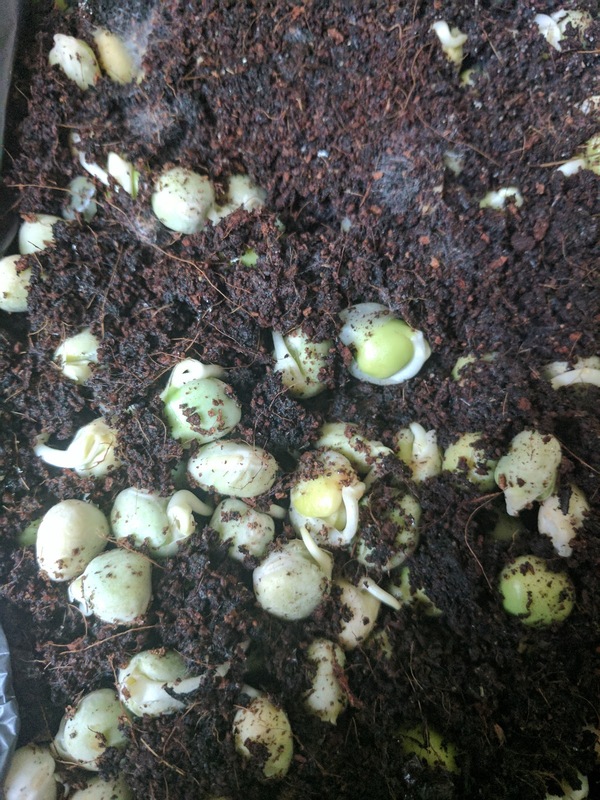 A few more sprouts, but nothing to really get excited about. After yesterday I was fantasising how they might have fully grown into harvestable shoots overnight. Here in reality, no such luck. Anyway, as I was eating I had a little brain wave (thanks again, water, or maybe it was the coffee) that I thought I'd share with you here. 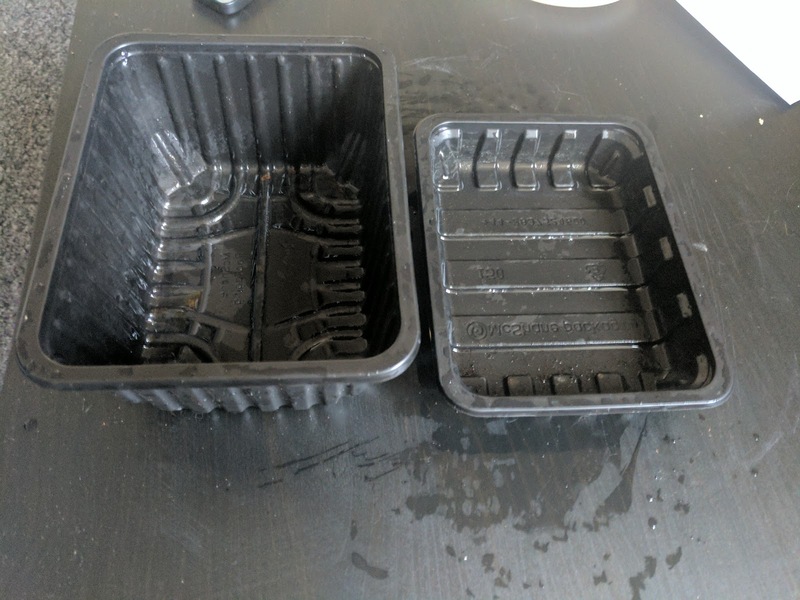 I've had a stash of these plastic containers for a while, the kind that mushrooms are sold in at the supermarket, wrapped in more plastic and which I am, therefore, trying to avoid. One I've already used for my first little succulent landscape but there's ten or so others that could use a good upcycling. 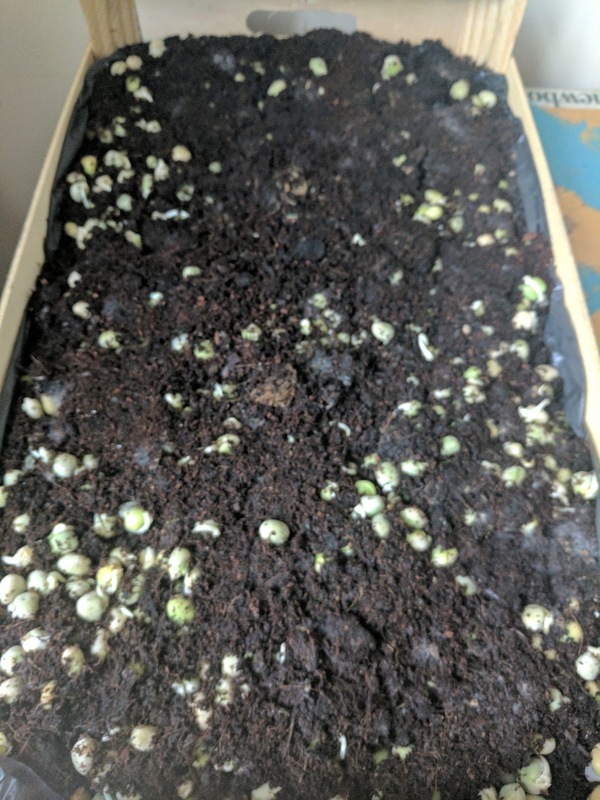 I noticed among the lentils and kale I was munching upon (1000 vegan points) that some of the lentils had started to sprout. 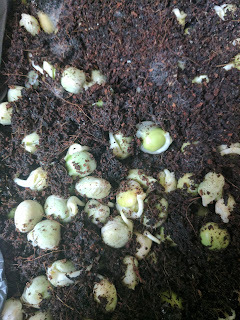 This might indicate that a little moisture has made its was into the sack - probably something I should keep an eye on, but it reminded me at just the right time, thank Providence that lentils are legumes, and that legumes are basically seeds, and that seeds, as we already know, grow. 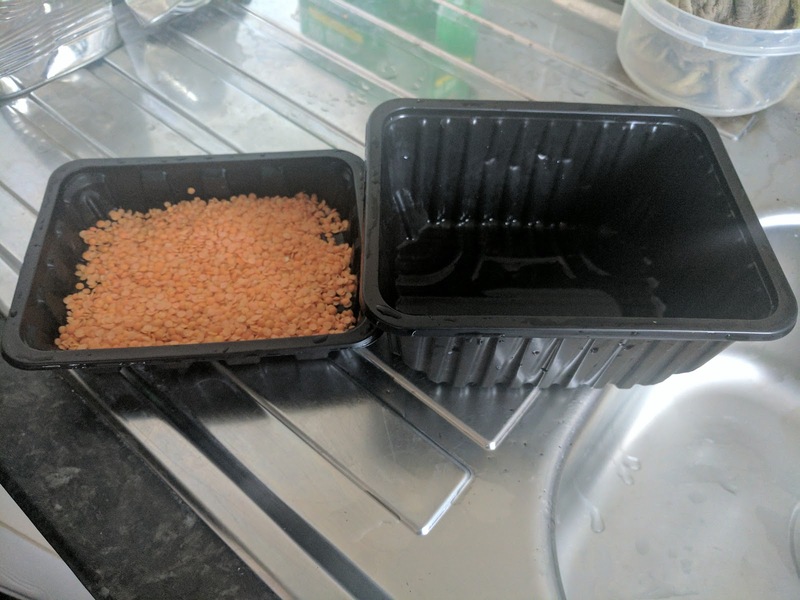 Surely there is microgreen potential here? Well, there is. 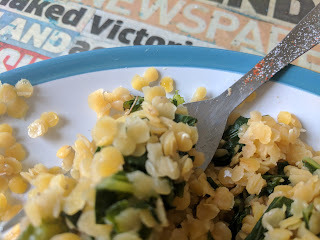 A quick hop over to YouTube to make sure; and of course, people are sprouting lentils all over the place. This video completed the idea. I took a shallower tray and poked some holes in it, and placed it inside a deeper one. Then I took a cup of lentils, and poured some water over them. 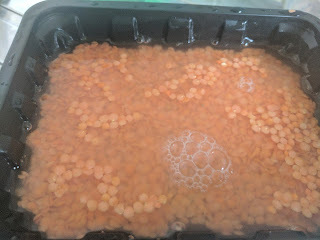 The water drained through the lentils and into container below. Presto: a handy little hydroponic lentil sprouter. I've covered it with an old pillow case and left it in my bedroom. Looking forward to seeing what comes of that. Another update tomorrow. (Day one is here, and day two is here). 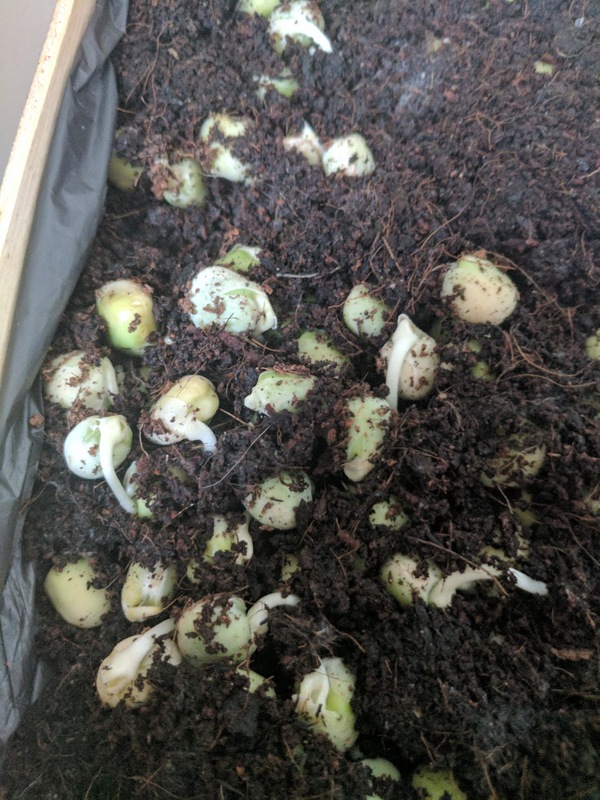 UPDATE: Day Four is here.